Board of Intermediate Examinations(IPE) TS Hyderabad has been decided to conduct Intermediate Advanced Supplementary Examinations in May 2019. So, the Schedule of Intermediate Advanced Supplementary Examinations May 2019 has been prepared by BIE Telangana ,Hyd . to be released on .... April 2019. Board of Intermediate Education Telangana on Sunday released the intermediate examination results for both first and second year general and vocational courses. This year, over 10 lakh students appeared for the Intermediate examinations. First year per cent is Percent. Second year pass percent is per cent. Those who have got compartment, can apply for the supplementary examination scheduled to be held from May 2019. 2. Fee for vocational course is Rs.400/- and also pay extra Rs.100/- for each subject. 3. Students can write exams with old hall ticket number only. 2. Practicals will be from May .... to May ..
3. Exam of ethics, human values will be held on June 7th environmental education on June 8th. 4. The same time table will be applicable for vocational students also. the last date for payment of examinations fee is April .... 2019. Marks Memo / Marks sheet: Students can meanwhile collect their mark sheets from their respective colleges from April ......2019. According to a press release issued by the board, no provision for payment of examinations fee with a penalty will be provided after the due date. For the first year students, who want to appear for improvement will have to pay Rs 150 per paper in addition to the normal examination fee while the second year students will have to appear for all the second year papers including practical. The students will be able to choose whether to retain the present performance or past performance. Advance Supplementary Inter Exams From May .....: The Board exams for intermediate students, on 13th April the results were released as usual the girls were toppers. A training program to be conducted to the inter supplementary students. Failed candidates May apply for supplementary exams before without late fee April...., 2019. The old students of vocational courses those who want to appear for 1st year exams can attend the exams for this time only. This is the last chance for them passed candidates can write exams for improvement. The Telangana State Board of Intermediate Education (Telangana BIE) released the 'Inter First and Second Year General and Vocational Results 2019' results on April .... Now, the board has opened the window for the revaluation/re-verification and recounting of the answer sheets. Note: Candidates will be allowed for only one service for one subject either re-verification or re-counting of valued answer scripts, said the official website. Revaluation and Recounting process: Moreover, the revaluation and recounting process will be opened from Apri 16 till April 20. According to reports, this year, nearly 9.4 lakh candidates appeared for the examination at various test centres across the state. #Details of TS Inter Supple Examination fee for 1st year and 2nd year. Results: TS Inter 1st year, 2nd Year Results 2019 Released available to Download. ........-05-2019 Modern Language Paper-I Geography Paper-I Modern Language Paper-II. Geography Paper-II. b) Ethics & Human Values Examination on ......-05-2019 from 10.00 A.M to 1.00 P.M. (One day). c) Environmental Education Examination on .-.....05-2019 from 10.00 A.M. to 1.00 P.M. (One day). #AP Inter Supplementary Exams May-2019 Time Table. Tags: TS Inter Advanced Supplementary Exams May 2019, IPE Inter Supplementary Exams May 2019 TimeTable Schedule, AP Inter Advanced Supplementary Exams, AP Inter Supplementary Exams 2019 Time Table. 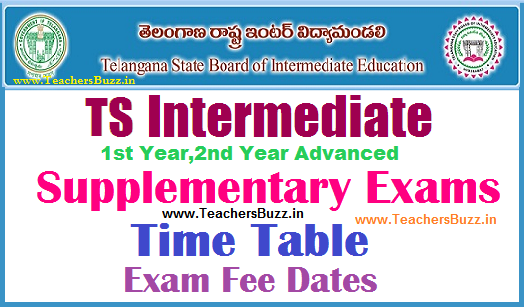 BIE Telangana IPE Inter Supplementary Exams May 2019 Time Table, Schedule, www.teachersbuzz.in, bie.telangana.gov.in ts inter supplementary exams 2019 time table,bie telangana ipe inter supplementary exams 2019 time table schedule,bie.telangana.gov.in inter first second year supplementary exams 2019 table,bie telangana inter 1st first 2nd second year 2019 time table.